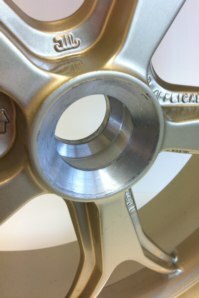 The Single Sided Adapter is used in conjunction with the abba wheel balancer for balancing single sided swing-arm rear wheels that do not have integral bearings. The two cones are made from a special engineering plastic so they will not scratch the paint on the wheel. Supplied with a 12mm shaft the Single Sided Adapter is suitable for all wheel balancers. Designed to fit most VFR's, Ducati's, Triumphs and some BMW models. Please note: This adapter is not suitable for the BMW K1200S/R, K1300S/R, 1200GS and GS adventure. 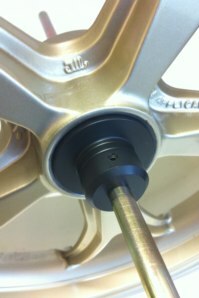 Please see our specific BMW Single Sided Adapter for these models. Made from high quality engineering plastic using the latest CNC technology. 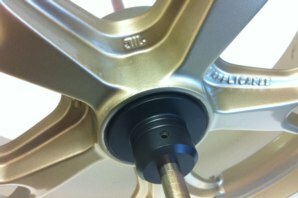 Will fit all single sided swing-arm rear wheels up to a diameter of 60mm. Does the abba Single Sided Adapter come with a guarantee? Got a Question about the abba Single Sided Adapter? If you would like to ask us a question about the abba Single Sided Adapter, simply fill in the form below and we will contact you within two working days. Want to tell a friend about the abba Single Sided Adapter? Alternatively fill in the form below and we will send an email on your behalf to your friend, with a link to this page all about the abba Single Sided Adapter.